Of course you want to walk around the house in style and these Doctor Who moccasins would be a great shoe to do that in. 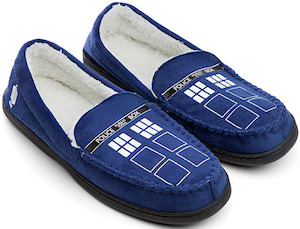 These moccasin slippers are white and fluffy on the inside and Tardis blue on the outside. And on the top of these shoes you can see the door of the Tardis and on the back heel you can find the Doctor Who logo. These Doctor Who moccasin slippers come in women’s sizes 8 and 10 and men’s sizes 10, 12 and 14. And this footwear is made from manmade materials so vegan friendly.